Why Aren't We Fully Monitoring These Active Volcanoes in the U.S.? The U.S. is one of the most volcanically rich countries in the world, with 169 active volcanoes. 57 of them are deemed high threats. But efforts to predict potential eruptions are being hampered by outdated equipment and lack of funding for scientific monitoring. As we are currently seeing in Iceland, volcanoes can show signs of unrest for hours, days and months before erupting. When that violent energy is finally unleashed, the results can be catastrophic—and not only for those in the immediate vicinity. Noxious gas emissions have caused widespread lung problems. Airborne ash clouds are a threat to aviation. The 2010 eruption of Iceland's Eyjafjallajökull volcano, for instance, spewed an ash plume that drifted over Europe, causing the closure of large portions of air space and resulting in an estimated $5 billion loss to the world's GDP. And, once that airborne ash falls to the ground, it can disrupt water, transportation and telecommunications systems for months or even years. In 1980, much of the $1 billion in damage ($2.9 billion today) from the eruption of Mount St. Helens was caused by volcanic ash—the total volume of which was equal to an area as wide and long as a football field and about 150 miles high. In the United States, most volcanoes are located in Oregon, California, Washington State, Hawaii, Alaska, and Wyoming (Yellowstone). And it's the Volcano Hazards Program (VHP) at the U.S. Geological Survey (USGS) that's tasked with monitoring them in real time. How far in advance can we predict an eruption? I emailed that question to Charles Mandeville, a volcanologist and geochemist who is the Program Coordinator at VHP. If the volcano has an adequate amount of ground-based monitoring instruments deployed on and around it …we can usually predict eruptive activity weeks to several months before an eruption. "Bear in mind that effective hazard mitigation measures can be completed even in an hour's time," Mandeville adds, "so early detection of unrest is critical, and this requires instruments in the ground." The problem is, there aren't always enough instruments in the ground. In 2005, the USGS conducted an inventory of the country's volcanoes, assessing the overall threat posed by each and comparing this to the existing monitoring capability. The resulting document detailed the monitoring gaps present at many of the most threatening volcanoes, and served as a blueprint for a proposed National Volcano Early Warning System (NVEWS). 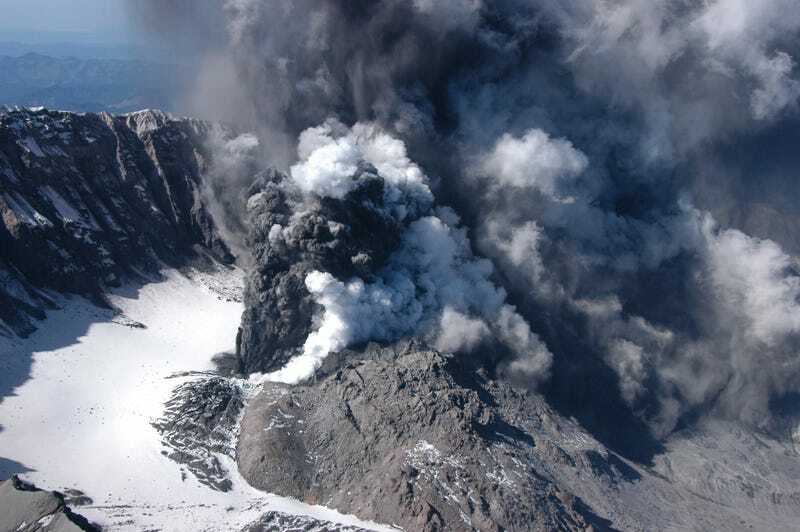 In the 25 years since the cataclysmic eruption of Mount St. Helens, scientific and technological advances in volcanology have been used to develop and test models of volcanic behavior and to make reliable forecasts of expected activity a reality. Until now, these technologies and methods have been applied on an ad hoc basis to volcanoes showing signs of activity. However, waiting to deploy a robust, modern monitoring effort until a hazardous volcano awakens and an unrest crisis begins is socially and scientifically unsatisfactory because it forces scientists, civil authorities, citizens, and businesses into "playing catch up" with the volcano, trying to get instruments and civil-defense measures in place before the unrest escalates and the situation worsens. Inevitably, this manner of response results in our missing crucial early stages of the volcanic unrest and hampers our ability to accurately forecast events. Restless volcanoes do not always progress to eruption; nevertheless, monitoring is necessary in such cases to minimize either over-reacting, which costs money, or under-reacting, which may cost lives. Recognizing that there are potentially dangerous volcanoes within the United States and its Territories that have inadequate or no ground-based monitoring, the USGS Volcano Hazards Program….is preparing a plan for a National Volcano Early Warning System (NVEWS). NVEWS is based on a systematic assessment of various hazard and exposure (risk) factors that are used to calculate a threat score for each U.S. volcano. The resultant scores permit a relative ranking of U.S. volcanoes into five threat groups from very high to very low. The level of monitoring called for by the threat assessment is compared to the current monitoring coverage at each volcano to identify those volcanoes with significant monitoring gaps that require improvements. The improvements should be implemented well in advance of the escalation of unrest with the aim of providing early detection of unrest and reliable forecasting of likely hazards. So, what's been done since the publication of that report, nearly a decade ago? Some of the changes have been organizational. The nation's five volcanic observatories have been assigned geographical areas of responsibility that, collectively, include all the potentially hazardous volcanoes listed in the 2005 report. Moreover, according to Mandeville, the "monitoring gaps" have begun to be addressed. Previous years, for instance, have seen the modernization of the monitoring network in Yellowstone, where analog radio technology was replaced by digital telemetry and, says Mandeville, "Nearly 20 seismic stations received improvements through a process of equipment swaps and installations, resulting in a network more resilient to power outages and better able to detect faint volcanic signals." New equipment was also installed at the Pagan volcano in the Commonwealth of the Northern Mariana Islands last summer, and there are plans to do likewise at Mt. Hood in Oregon. "We are, at present, about 29% towards completion of the NVEWS implementation," Mandeville says—which is also a way of saying that they're still 71% away from completion. Why, after nearly a decade, hasn't more progress been made? As with all government projects, the USGS has had to navigate its way through the modern-day Scylla and Charybdis of funding and bureaucracy. Many of our potentially active volcanoes in the U.S. are on lands managed by the U.S. Forest Service. In other cases potential sites for ground-based instrumentation may fall on privately held lands or tribal-held lands. As such, if we are planning to install monitoring instruments on lands managed by another federal or state agency, we have to apply for permits to those agencies. That requires fostering relationships, and that takes time. And the installation of the instruments must be kept as low profile as possible to preserve the pristine nature of the site. As for the budget, much of the activity required to close the volcano monitoring gaps didn't begin in earnest until a few years back, when the VHP received $15.2 million in funding between 2009-2011, through the American Reinvestment and Recovery Act's stimulus funding package. But, in 2011, no action was taken on an authorization bill introduced by Senator Lisa Murkowski (R-AK) for the National Volcano Early Warning System. And no other authorization bills earmarked for NVEWS have been introduced to Congress since then. As such, the Volcano Hazards Program has had to make due with the money in its general budget. The declining overall VHP budget since 2012 has forced us to defer maintenance on monitoring networks, particularly in the Alaska region for the past few years. The impacts of a declining Program budget were exacerbated by sequestration in FY2013 and we are now dealing with repair of failed monitoring networks in Alaska in FY2014. Fortunately, we did have an increase of $400,000 in the FY2014 Omnibus and much of that increment in VHP funding is being applied this summer to restoration of failed networks in Alaska. Even with the $400,000 increment to our budget, it will take several years to restore all of them. In addition, some of our budget increase has to be applied to closing monitoring gaps at other Very-High-Threat volcanoes in the lower 48 states such as Mount Shasta and Mount Lassen in California and Glacier Peak in Washington State. Glacier Peak, in fact, is an example of how the lack of funding is hampering efforts to close the gaps in volcano monitoring. Despite being a "Very High Threat" volcano, Glacier Peak has, at present, only one seismometer in place. VHP has been trying to make progress this summer by acquiring high-resolution LIDAR data that will help generate a new geologic map of the volcano and help to determine the optimal location for new ground-based instrumentation. Mandeville says that VHP was only able to leverage the funding for the LIDAR project through partnerships with other USGS programs and the U.S. Forest Service. For volcanoes that still lack ground-based instrumentation, VHP is unable to forecast possible eruptions. In those cases, its efforts are limited to eruption detection through remote-sensing satellites, which provide images of a specific location only once every 4 to 8 days. Another approach has been checking data from the World Wide Lightning Location Network, which has sensors around the globe and across the United States. It's common to have thousands of lightning strikes in a very confined area near the volcanic plume during an eruption. (One theory is that the lightning is generated by ash particles colliding with one another.) When VHP sees this in a high latitude area with no weather system capable of generating lightning—such as in Alaska— it's usually due to an eruption. How much longer until the USGS is finally able to close the volcano monitoring gap that it identified back in 2005? Mandeville says that "we may get towards significant completion over a ten-year period," but even this will be mostly limited to Very-High-Threat and High-Threat volcanoes. That timeline could be shortened if the USGS received additional funding. It's enough to make you erupt in frustration.